Chances are if twenty years ago you contacted 50 random leading companies and approached their CEOs with a question: “Have you ever seen the work day come to an end?”, most likely, more than 70% would say no. The slight percentage would spend their work days sitting in their king-sized, high-back chairs free from hateful neck cracks, feeling like a million dollars. I bet partly this let up at work was due to an adopted outsourcing model and benefits it brought in, like outside expertise, cut cost, streamlined task fulfillment processes and low risks. With the rise of outsourcing, in particular, software development outsourcing, the tide starts to turn and numbers change. Outsourcing engagement models either edge out or complement traditional ones, giving inner company processes a major revamp. 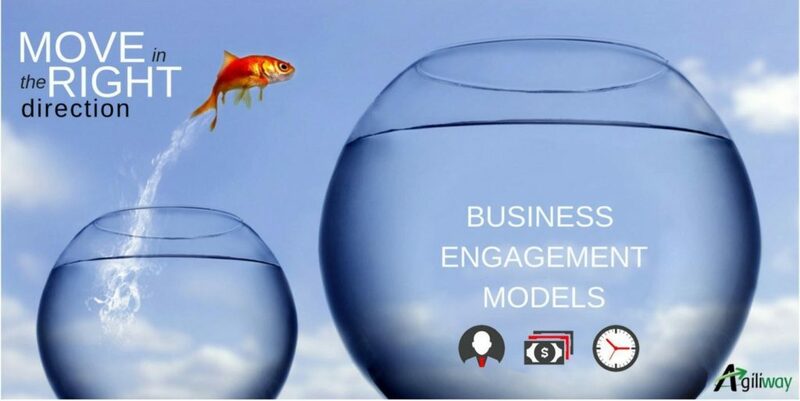 The business engagement model reads as strategic partnership oriented towards creating value, sparing efforts and meeting goals. Strategic partnership with an IT outsourcing provider starts the moment a vendor selects the vehicle of its own success from the taxonomy of business engagement models. To ensure your vehicle doesn’t stop midway, Agiliway has given numerous business models a test drive and made the most out of this experience by offering our clients only the most value-adding models. Learn more about each of three tried-and-true engagement models in software development outsourcing and decide which works for you. Under the fixed price engagement model the client entrusts the IT solution to a software outsourcing vendor and steps back until the agreed date arrives for taking over a market-ready build. In cases like this, clients either have a clear vision of an end product or at least a set of well-defined requirements. During the discussion stage the scope, budget, main development stages, and deadlines are fixed, documented and final proposal with billing is submitted for consideration. When the agreement is concluded and the process of project implementation starts, no major alterations are welcome. Any deviations trigger additional expenses. 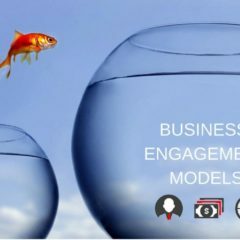 While this business model thrives in some companies, it is not the best option when engagement scope turns out to be rather provisional and risks estimates have low precision. In such cases, clients will pay separately for any extra features. The service provider, in its turn, will try to balance the technical and management risks by feeding them into the pricing process. Popular among companies seeking access to new skill sets, this software development outsourcing model exempts the client, mainly western ISV, from the need to search for talents or provide necessary infrastructure. Accordingly, expenses go down as the outsourcing provider takes all the responsibility for filling the company staffing needs by hiring, training and integrating new members into a team within a short period. From the very outset both parties agree on cost per employee, workload hours new team member will allocate to the project and duration of cooperation. Despite the strong potential of the rate based outstaffing model, it has its slight hitches, some of them being rather considerable management effort and only partial control over the team members. The outsourced vendor is obliged to provide workplace and necessary working conditions, ensure the day-to-day operation of dedicated engineers, yet successful project implementation rests with the client. The issue with the lack of the control over the team is easily resolved when the client shifts to BOT engagement models. The BOT Cost+ model comes to the foreground when the company management decides to move their IT functions to a distant location and increase their development capacity by setting up an offshore devcenter. As per this transitional model, an outsourcing company makes commitments to build a fully-functional team and optimize it for effective service delivery operation. Team establishment takes a few weeks during which the outsourcing provider is fully responsible for staff recruitment and training, facilities management, administrative and legal matters and quality assurance of day-to-day operations. When the team reaches operating stability, the offshore entity with supporting assets is transferred to the owner company. Long setup time used to cast a dark shadow on the model itself. However, the prospects have brightened up the moment the notice period in some outsourcing destinations went down, e.g. in Ukraine, it has reached a rock bottom 2 week time period. The fully functional team is usually up and coming for transfer and long term cooperation within a few months. A smart way of outsourcing, the BOT Cost+ model has found its proponents among companies that work out long-term business strategies and plan within a few years window. After transfer, some of our BOT clients either use Agiliway advisory and consultancy services to handle operations or lease some of our local managers to delegate operational control. For an easy visual perception, the comparison table above summarizes the core elements of each model discussed above. What’s the objective of my engagement? Do I intend to extend an in-house IT unit (rate based outstaffing), partner with an outside team to have a well-defined one-off task completed (fixed price) or build an offshore team for recurrent projects (BOT cost +)? How far am I willing to go? Short (fixed price) or long term (outstaffing, BOT) cooperation? Would I rather take risks with minimum pay (cost +, rate based outstaffing) or pay extra to eliminate all risks (fixed price)? Do I need a team of full-time resources (outstaffing, BOT) or one expert in a particular field (rate based outstaffing) will suffice? Should I opt for lower risk options (fixed price, outstaffing) or the possibility to have full control over my remote resources (BOT )? Rapid project team mobilization (fixed price) or control over the outsourcing venture (BOT, outstaffing) makes all the difference for me? Now move in the right direction to extend your skill sets, step up software development processes at a lower cost and reach beyond what your internal team might have come up with. And remember all these models are prone to modifications and Agiliway will tailor them to best suit your needs.